A modular management solution that combines stylish profiles and elegant accents with top-grade fit and finish. Abrasion- and stain-resistant high-pressure laminate with elegant hardwood trim. Drawers ride on steel ball bearing suspensions; file drawer extends fully and accommodates letter and legal size hanging files, box drawers extend three-quarters. HON “One Key" core removable locks make re-keying quick and easy. 10-1/2" conference overhang provides added knee space for guests. Full-height modesty panel for privacy. Convenient cable management with two work surface grommets. A modular management solution that combines stylish profiles and elegant accents with top-grade fit and finish. Abrasion- and stain-resistant high-pressure laminate with elegant hardwood trim. Drawers ride on steel ball bearing suspensions; file drawer extends fully and accommodates letter and legal size hanging files, box drawers extend three-quarters. HON "One Key" core removable locks make re-keying quick and easy. 10-1/2" conference overhang provides added kneespace for guests. Full-height modesty panel for privacy. Convenient cable management with two worksurface grommets. With practical functionality, uncompromising durability, modular adaptability, double-pedestal bow-top desk is well-suited for managers, supervisors and support staff in any office layout. design features scratch-resistant, spill-resistant and wear-resistant laminate on a strong inner frame as well as one box and one file drawer in each pedestal. both drawers lock. box drawers operate on ball-bearing suspension with 3/4 extension. file drawers extend fully on long-lasting, steel ball-bearing suspensions and include hangrails for letter-size or legal-size filing. five-sided construction allows easy drawer alignment or removal of drawer fronts. 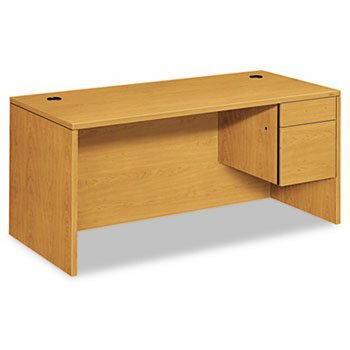 desk is equipped with interchangeable core-removable locks to make rekeying quick and easy. two grommets in top route and hide cords to reduce desktop clutter. adjustable hex leveling glides allow floor-standing furniture to be easily leveled without lifting the unit. glides have a 3/4" adjustable range. center drawer for desk is sold separately. Hard-working, good-looking and built to survive a lifetime of overtime. Durable abrasion- and stain- resistant laminate. Drawers operate on ball bearing suspensions; file drawer extends fully and accommodates letter or legal size hanging files, box drawer extends three-quarters. HON "One Key" core removable locks make re-keying quick and easy. Full-height modesty panel for privacy. Two cord management grommets. 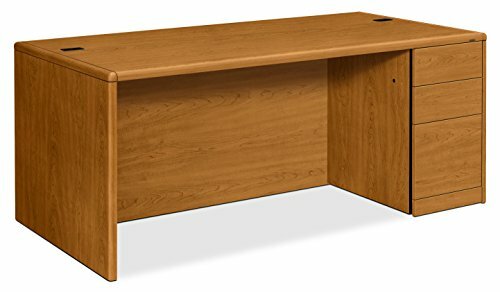 Desk and Return sold and shipped separately--ORDER BOTH. 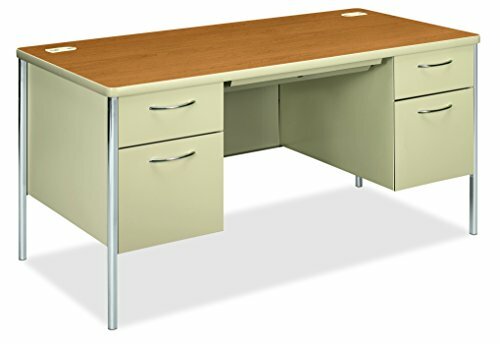 Mentor Double Pedestal Steel Desk features radius leg design, arched drawer pulls, 3/4" height modesty panels and rounded edge desktop with soft feel-vinyl edge. Desk offers wire management grommets. 13-1/2" deep, central locking center drawer has a HON "One Key" interchangeable lock core. Keyed alike cores must be ordered separately. High-sided file drawers accept hanging files without handrails. Spring-loaded, follower blocks are adjustable on 5/8" centers. 3/4 extension box drawers with one divider provide 21" deep filing capacity. Sound-absorbing material allows quiet drawer operation. 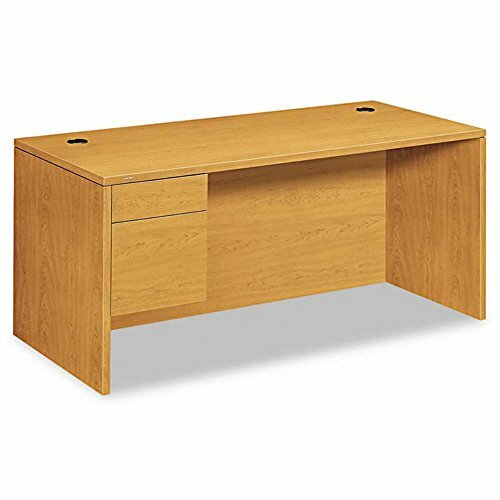 Reinforced double "O" frame inner structure keeps desk solid and sturdy for years of use. Full-extension triple-tied cradles on all file drawers provide 21" deep filing capacity. Vinyl edge and painted leg matches specified chassis color. All interior drawer bodies are made of painted steel. Desk meets or exceeds ANSI/BIFMA and ISTA performance standards. A modular management solution that combines stylish profiles and elegant accents with top-grade fit and finish. Abrasion- and stain-resistant laminate with elegant hardwood trim. Drawers ride on steel ball bearing suspensions; file drawers extend fully and accommodate letter and legal size hanging files, box drawers extend three-quarters. HON “One Key” core removable locks make re-keying quick and easy. Full-height modesty panel provides privacy. Two grommets on worksurface for cable management. Hard-working, good-looking and built to survive a lifetime of overtime. Durable abrasion- and stain- resistant laminate. Drawers operate on ball bearing suspensions; file drawer extends fully and accommodates letter or legal size hanging files, box drawer extends three-quarters. 10 1/2" conference overhang provides kneespace for guests. HON "One Key" core removable locks make re-keying quick and easy. Full-height modesty panel for privacy. Two cord management grommets. 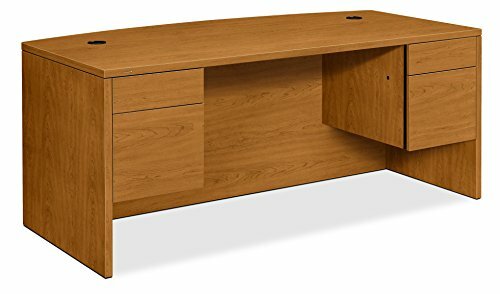 Desk and Return sold and shipped separately--ORDER BOTH. 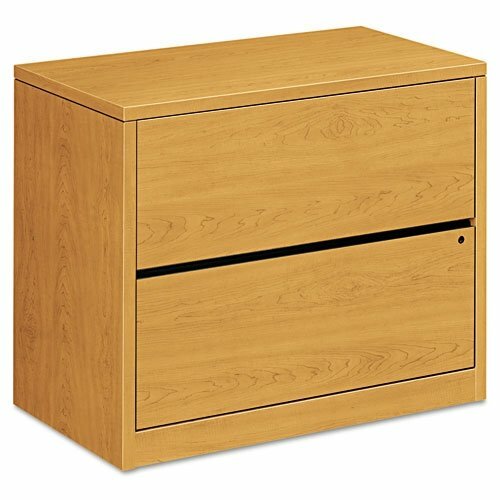 Lateral file is compatible with hon 10500 series laminate wood furniture. clean, straightforward design with square edges offers a streamlined look. drawers operate on ball-bearing suspension with full extension. all drawers have a five-sided construction. hangrails are provided in all file drawers for side-to-side letter-size and legal-size filing and front-to-back for letter-size filing. adjustable hex leveling glides allow floor-standing furniture to be easily leveled without lifting the unit. glides have 3/4" adjustable range. lateral file is equipped with hon one key interchangeable core removable locks to make rekeying quick and easy. lateral file is certified by scs to be in compliance with specific indoor air-quality emission requirements and meets or exceeds ansi/bifma and ista performance standards. Redefine your workspace with the clean lines and industrial style of this L-shaped desk from the Lindon Place collection. Its spacious tabletop surface provides you with room for all your must have office essentials – laptop, collection of notepads, folders and more. 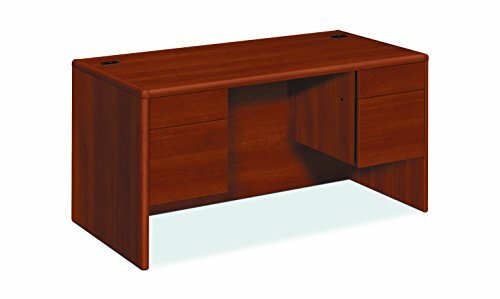 It features two easy gliding drawers with full extension slides for easy access storage of all your go-to office supplies. Behind the metal door with a wire mesh front is an adjustable shelf for all your additional storage needs. It also features an elevated shelf for you to showcase and display photos, awards and home decor. It also includes grommet holes so you can keep all your cords and wires neat and out of the way. Constructed with a durable, powder-coated metal frame and finished on all sides in Vintage Oak with black accents, this uniquely chic desk gives your home office or workspace a fresh new look that is sure to have you motivated and ready to work. The office inspiration that you’ve been looking for. Create a fresh new look in your home office when you add the charming style and modern design of this desk from the Better Homes & Gardens Glendale collection. Its spacious top surface provides you with all the room you need for your must-have desk essentials like your laptop, stacks of notepads, a cup full of pens and of course your favorite coffee mug. It even has space for some home décor like a lamp and picture frames too. It features a storage drawer that opens and closes on smooth metal runners for easy access storage of miscellaneous items. It also includes a file drawer with full extension slides that accommodates letter-size hanging files so you can keep all your important papers organized. 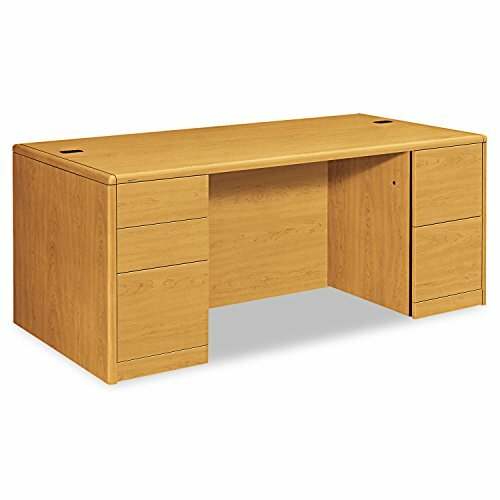 Finished in Dark Oak and detailed with attractive hardware, this beautiful desk gives you the style you want with the functionality you need. Drafting Table, Tribesigns Multi-Function Drawing Table with Adjustable Tiltable Stand Table Board, Can Also be Computer Desk, Writing Desk or Workstation for Office and Home Use. The Drafting Table with liftable stand board by Tribesigns offers an open, spacious place for you to create. 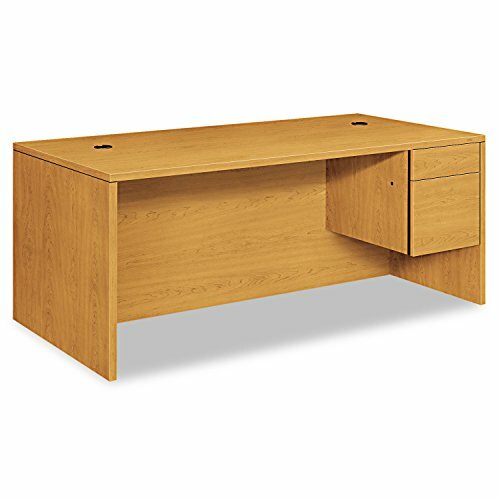 This simple yet elegantly designed desk features a top angle adjustment ranging from 0 to 80 degrees and two lower storage shelves. Both are for the convenience of your work.An ordinary may not meet your various demands, however such a charming desk, which can is perfect solution for multi-purpose usage. 12 setting for multi position Stainless steel stand provide 12 setting for you and allow you to fix it in any position from 0 to 60 degrees. 2-Tier Shelves Features a 2 shelves partition that can accommodate various important items so that they are easily accessible. E1 Grade Panel Utilize E1 grade panel to ensure its wear-resistant, heat-resistant and easy to clean. Anti-pinch Design Considerate anti-pinch design protect children or when you adjust stand board from pinching finger. Thicken Metal Frame Thicken heavy duty solid metal frame, which ensures sturdiness and years of reliable use. Adjustable leg pad Leg pad made from Polypropylene which can protect the floor from scratch and adjust height to ensure its stability.